As we age, even our discs are affected from repetitive wear and tear. 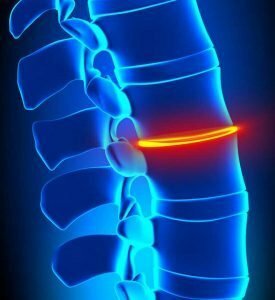 As the aging process progresses, the water content inside our discs decreases which causes them to become dehydrated, shrink, and loose their ability to act as cushions for the vertebra. This makes our spinal segments come closer together and unstable. Our bodies try to defend this by tightening up muscles and ligaments which causes stress on bones. The bones react by building more bone to strengthen the attachments of the muscles and ligaments. Also, because the vertebra are closer together, other conditions such as facet syndrome and herniations may result. Treatment is directed towards rehydration in order to increase flexibility, elasticity, and the shock absorbing characteristics of the disc. IDD Therapy® rehab helps to rehydrate the disc by stimulating fluid exchange between the immobilized structures. Disc fluid and other necessary nutrients flow back into the disc to help the disc regain its structurally sound characteristics. Image depicting compression in the disc space.